Aluminum profile samples architectural coping heat sink tubing enclosure 6061-T6 alloy temper 6063-T5 alloy temper anodized. Contact us for more information at 440-543-8660 or request a quote. 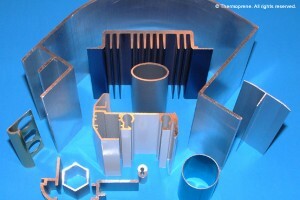 View our Aluminum Extrusion Gallery. © Copyright 2015 Thermoprene, Inc. All Rights Reserved. 10120 Gottschalk Parkway	Chagrin Falls	Ohio	44023	USA	Website design and development by World Synergy, web marketing firm.